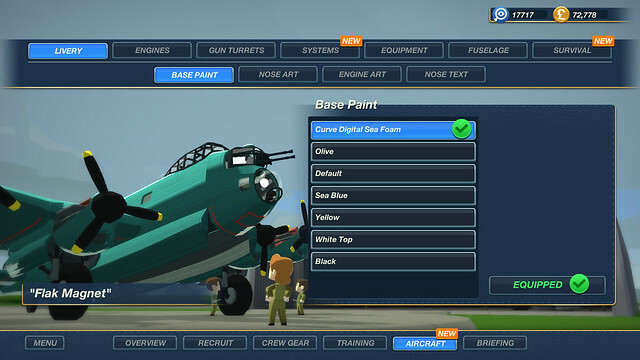 Chocks away with Bomber Crew, manage your crew and plane right or suffer losing everything. Aaron and Jack from Pizza Games Funtimes met the developers at EGX Rezzed 2018. Check out their video from the day for their reactions. ‘Tally ho old bean! Pip pip and all that! Huzzah!’ and so on and so forth. If you hadn’t already worked it out, Bomber Crew is set in World War II and absolutely everyone has a jolly stiff upper lip and that is absolutely spiffing! Bomber Crew has been around since October 2017 for Steam but is finally heading to the console world and what a rip-roaring good shout it is as well! Bomber Crew is a crew-management sim game, similar to the likes of FTL, that sees the player taking command of a WWII Lancaster Bomber to fly off and drop some ‘cookies’ on them nasty old Jerries. The plane itself has a number of different tasks that need to be taken care of, such as; flight path management, altitude, the health and safety of the crew, bomb targeting and general staying alive-ness. 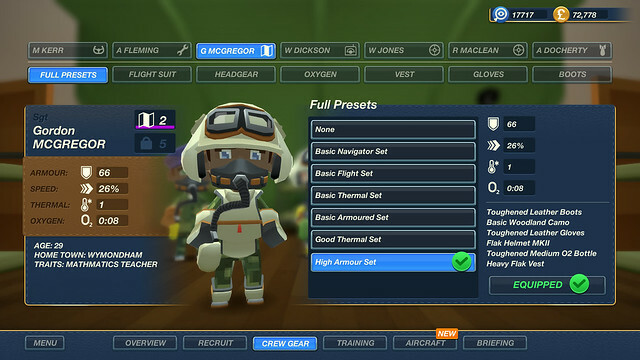 The planes are customisable with different liveries, weapons and engines along with the crew that you can manage and level up as you complete missions. The crew members are persistent characters so you may find yourself becoming rather emotionally attached to the brave men and women who are struggling to maintain your aircraft – which is emphasised when you learn that aircrew suffer from the dreaded permadeath if something does go awry. The gameplay itself comes fast and intense, with missions racking up the difficulty quite significantly – a simple reconnaissance mission ending up as a daring bombing raid followed by a hurried escape as the ace fighter pilots of the Luftwaffe sweep in to try and take you down. Luckily a number of special abilities from the characters you choose can help out in a mission, for instance being attacked by enemy fighters to then call in your own Spitfire squad is a sight to behold and really ramps up the excitement. A big difference from a game like FTL is there is no option to pause to pass out orders to your crew. Everything happens in real time so a hairy situation can easily turn into a disastrous one if preparations aren’t made and panic sets in. This works so well with the setting and adds so much more to the feeling of imminent peril when things start to go south. We love the style of the game as well. WWII is a difficult subject to handle and especially the grim story of the bomber pilots is a tough one to make fun and exciting. 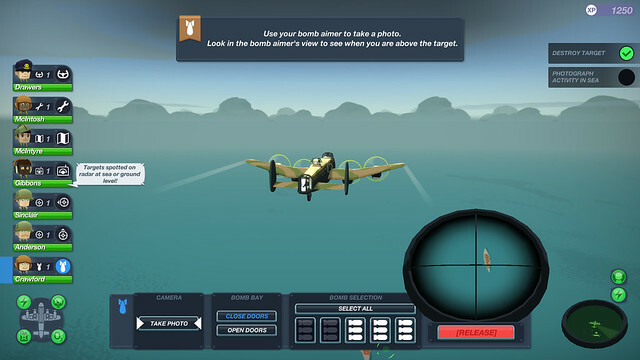 With its cartoony art style, and honest British wit, Bomber Crew triumphs here by simultaneously portraying a fairly accurate simulation of running a Lancaster bomber in WWII and also being a truly exciting and fun to play game with just the right amount of jeopardy and narrow escapes. Bomber Crew is already out for Steam and will be heading to Xbox One, PS4 and Switch later on this year. Great fun all round and definitely a little different to the usual WWII games.